President Donald Trump said Friday that he’s considering using military resources to finish construction of his long-promised border wall instead of relying on Congress to fund the project through the Homeland Security Department’s budget. He also wouldn’t eliminate the possibility of a government shutdown if Democrats continue to confound his efforts to appropriate money for the project on the U.S.-Mexico border. 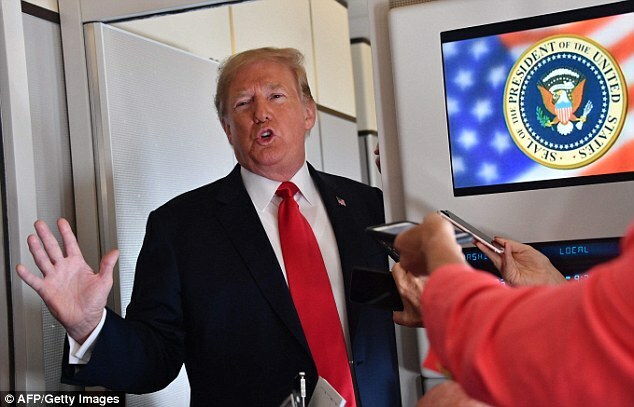 ‘We have two options,’ he told DailyMail.com aboard Air Force One as he flew from Billings, Montana to Fargo, North Dakota. ‘We have military, we have homeland security.’ He was asked specifically about using the Army Corps of Engineers as a taxpayer-funded construction crew. President Donald Trump said Friday that he’s considering using military resources to finish construction of his long-promised border wall, as she spoke to the press on Air Force One, above on Friday ‘We have two options,’ he told DailyMail.com aboard Air Force One as he flew from Billings, Montana to Fargo, North Dakota. ‘We have military, we have homeland security’ Trump said he would prefer to fund the ambitious construction ‘the old-fashioned way – get it from Congress – but I have other options if I have to.’ He’s seeking about $25 billion. The possibility of diverting Pentagon funding and assets to build a border wall is a hole card the president is holding but has never directly acknowledged before. Two Defense Department officials told DailyMail.com in August that the Army Corps of Engineers could take on the task. The White House appears headed for another confrontation with Congress over an increase in funding for the project after securing $1.6 billion for 2007 and the same amount for this year. A senior White House official said Thursday that the money was ‘basically a down-payment on the thing’. The possibility looms that the president will refuse to sign the next federal budget, due September 30, if lawmakers don’t go along with more installments. That would trigger a government shutdown. ‘If it were up – I don’t want to say “up to me,” because it is up to me – I would do it,’ he said aboard Air Force One, ‘because I think it’s a great political issue.’ But he said some Republicans in Congress, facing tough re-election fights, have counseled more patience.